From learning to entertainment, VR has captured a plethora of opportunities and fields. Questions about VR being safe for children were raised continuously but now seems to finally be answered accurately. For all those parents who dread showing VR content to their kids, it’s completely safe for children above 12 years of age but the most important thing is the right type of content. See also: What are the unique requirements of public VR? We witnessed a steady growth in VR for kids this year and decided to share with you the amazing things VR could do for your children. 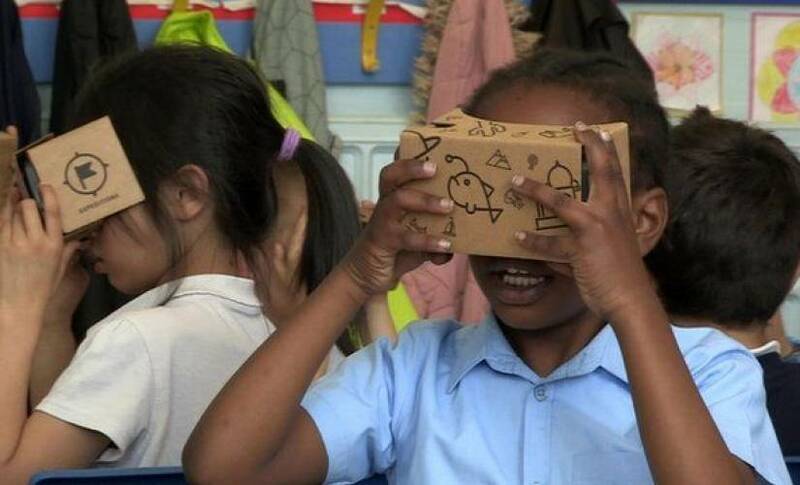 One of the most known VR experience for children this year was Google Expeditions. The app became available in 123 countries and counting. It was an amazing tool for teachers to pair up along with the classroom sessions, after all, what’s better than a field trip to educate children? Students can have a better outlook & a faster learning experience with the help of this tool which lets them travel places and learn about them by being there in the virtual world. Autism is a lifelong neurological disorder & research says that no two people with Autism have similar symptoms. We have come across a number of uses for VR in medical science & this is no different. Immersive Autism Therapy is a combination of scenarios created by a Washington-based start-up Floreo. With the help of these scenarios, children are enabled to learn skills such as pointing or making eye contact. VR is the safest option to teach them various social skills and prepare them. Other applications to teach young people how to drive and to enter work environment had also been created this year and delivered positive results. No wonder virtual reality has contributed enormously to improving the treatment, training, and quality of life of children with disabilities. It has helped therapists to create a life-like environment for children for training & skill enhancement. The quality of life of these children can be improved significantly using VR. As important as these experiences are VR helps them in social training too which shapes their personalities in a positive way. Beyond the social experiences, gaming in VR is one hell of an experience for wheelchair-bound children. With VR these children can fight without hands & run without legs. With the advent of mobile phones and other digital stuff, there are hardly any children today who remember the value of bedtime stories. However, Samsung thought this year that the “Bedtime VR Stories” app will combine the latest innovations in virtual reality with the power and importance of traditional storytelling. Samsung believes that this application is more for the parents who are away from their children and still will be able to tell them bed time stories through VR as they get carried away to far distant galaxies with other unreal stuff. Sounds interesting. How amazing would it be to learn swim without actually being pushed into the pull by the swimming coach? Children often fail to learn how to swim because of their fear of water, heights or anxiety but that doesn’t mean they mustn’t learn the most important life-saving skill. Energy Company E.ON, the Swedish Swimming Federation and M&C Saatchi Stockholm partnered up earlier this year to launch a campaign that uses VR to encourage nervous children into the water. The best way to treat a fear is exposure and VR does it the best.